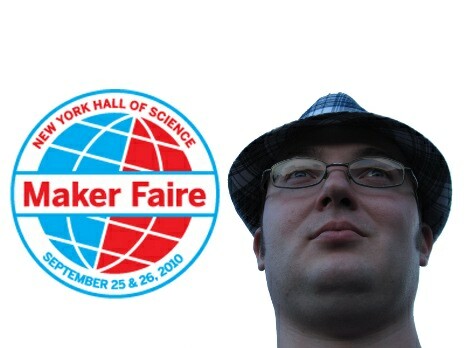 A quick heads-up to those of you that will be at the New York Maker Faire and the Open Hardware Summit.One of our writers, [Devlin Thyne], will be there checking out projects and handing out Hack a Day stickers. Be sure to stop him to say hello and maybe show off your projects. We look forward to seeing you and your projects. a preliminary howdy from HacDC http://www.hacdc.org, DC’s Hackerspace. Too bad I don’t have the funds to travel to NY. At least Dearborn (Detroit) was good. Also a preliminary howdy from SIG315, http://sig315.org , Syracuse NY’s premier hackerspace. Maker Faire seems to be assiduously avoiding the LA area. Why? I dub this style of photography the inverse-myspace-angle. I hope I can make it through the fair without seeing this guy. Is this a warning? “Avoid this big fat head” If it is thank you. Well I will definitely be there, on the first day. That’s the Saturday. But please also remember we all started some place. Not all of those articles are written for the gang still surviving Middle School and even Junior High. Now if you can present something that you, yourself, created and wrote up in that magazine, now that would be different. I usually try to stay neutral on this sort of thing, but as a person who recently cancelled his MAKE subscription, I have to agree with the previous posters. The first issues of MAKE were excellent, but later degraded into little more than an activity book for children. I think I realized I wanted to cancel my subscription after the magic issue that showed you how to make a bunch of kid-level magic tricks. As I recall, a few were even submitted by children. Ostensibly this is some sort of art, but in practical terms it was a waste of my time and subscription money. Well folks I was indeed there for a while. I hate to dissapoint all of you, but there was absolutely nothing like what you’re all complaining about. My only problem was with those jet engine powered vehicles. Too noisy and too close to everyone. It turns out that the riders were not wearing ear protection. So of course we were not told we should also. I also met the gang from Sparkfun, they were teaching a small crew how to solder. They were quietly amazed at the fact that I knew of them, and even bought stuff from them. A gentleman was selling electronic kits. I picked up one that resembled the idea of a certain contributor regarding optical mouse units, and acting like a small image sensor. In all it was not a waste of my time. It was time well spent. It was a good way to spend time outside in NYC, and on the grounds of the Worlds Fair. Note to Hack A day, I did not see anyone resembling your reporter. I did also visit with the group at Liquidware, they were amazed at discovering that their product wrapped around a Beagleboard was a big hit here. A waste of my time would have been next door at Citi Field.